Gov. Ige surveys Kauai storm damage. See Kauai category below for extensive coverage. Changes to Quiet Title Law Still on the Table. A bill before the State Legislature may make it harder for new landowners in Hawaii to clear title to their piece of paradise. Proponents of the bill say it would help native Hawaiians preserve ancestral lands. Hawaii Public Radio. State Sen. Donna Mercado Kim continues to lead her opponents when it comes to raising campaign cash in the race for Hawaii’s 1st Congressional District, which covers urban Oahu. Civil Beat. Recreational aquarium collection permits voided. Conservation groups hope there will be plenty of fish in the sea following another legal victory against the Department of Land and Resources. West Hawaii Today. A rumored merger between Marriott Vacations Worldwide and ILG Inc. could create the largest timeshare company in Hawaii, creating competition for Hilton Grand Vacations. Pacific Business News. Officials torn on how to get rail money. Key city officials Monday assured top brass at the Federal Transit Administration that they are committed to providing the city’s share of funding for the financially strapped rail project. Star-Advertiser. A Honolulu City Councilman is requesting emergency proclamations to help homeowners in East Honolulu who sustained severe damage from flooding on Friday. Star-Advertiser. Worst flooding for East Oahu in 30 years. Oahu's torrential downpours created East Oahu's worst flooding in three decades. KITV. City to create temporary dump-sites for residents to discard storm debris. Hawaii News Now. With a little help, East Oahu cleans up after flash flood wallops area. Star-Advertiser. Olomana golf course closed indefinitely, owner behind on payments. A popular golf course in windward Oahu shut down without any notice on when or if it will be reopened. KHON2. Bowling Alley Supporters Fight For ‘Soul Of Kailua’. Millennials lead the charge to convince a development company to hold off on its plan to redevelop the Pali Lanes site. Civil Beat. Fatboy’s restaurant owner charged with tax violations, faces imprisonment. Pacific Business News. Funding for ambitious plan to fix county transit system still needs to be worked out. More reliable buses, more routes and better coordination are coming to the county transit system, if recommendations of a master plan discussed Monday evening are implemented. Tribune-Herald. SpinLaunch reps face criticism during informational session in Naalehu. Ka'u residents during a community meeting Saturday expressed their considerable disapproval of a facility proposed to be built in Ocean View that would launch satellites. Tribune-Herald. Kilauea’s summit lava lake is the highest it’s been in more than a year. Tribune-Herald. Man swept into ocean while reportedly fleeing from police. Tribune-Herald. The Ahihi-Kinau Natural Area Reserve area on Maui’s south shore will remain closed until at least Monday, April 23, 2018 due to the continued presence of sharks in the popular snorkeling destination. Maui Now. Southern terminus of Lahaina bypass blessed. The 2.6-mile-long, $38.7 million roadway is set to open April 23. Maui News. Tri Park Annual Pass fee to increase. Maui News. Emergency responders rescued more than 200 people by helicopter Monday after they were stranded on Kauai’s North Shore following a severe storm that walloped the island this weekend. Star-Advertiser. State to Kauai flood evacuees: We don't know when you'll be able to go home. Hawaii News Now. The Path To Recovery In Hanalei Will Be A Long One. The record-setting storm, which dumped 28 inches of rain in 24 hours, has dramatically changed the North Shore of the island for some time to come. Civil Beat. Evacuation and relief efforts were to continue Tuesday morning in Kauai communities devastated by severe flooding. Hawaii News Now. Community races to help. When tragedy strikes on Kauai, the community comes together. Garden Island. Rescue and relief efforts continue on Kauai, some areas of the Garden Isle is destroyed. KITV. First-hand look at extensive flood damage, rescue efforts on Kauai. KHON2. Gov. David Ige, Kauai Mayor Bernard Carvalho, and military and county emergency crews took a helicopter tour of the devastated areas of the North Shore aboard a Hawaii National Guard Black Hawk Helicopter Monday morning. Maui Now. View from above shows devastation. 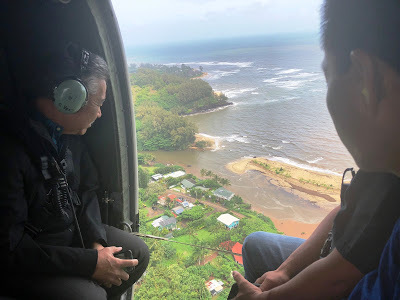 Mayor Bernard Carvalho Jr. saw the view from above on a helicopter tour Monday and got a true understanding of the devastation that happened in Hanalei, Haena and Wainiha over the weekend. Garden Island. Jessica Else shares perspective of the situation in Hanalei after bridge opens. Garden Island. What you can do: How to help Kauai flood victims. Hawaii News Now.